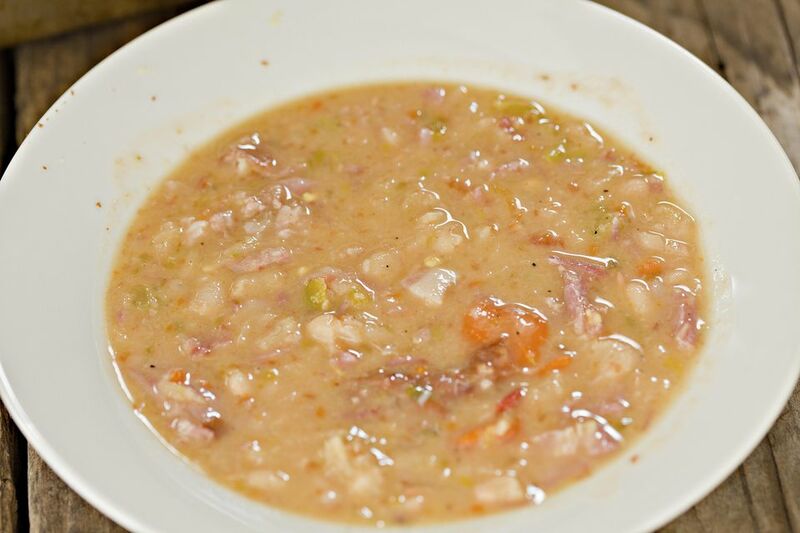 This delicious slow cooker bean and bacon soup recipe is the perfect winter comfort food. The recipe is inexpensive, thick, rich, and flavorful, with the best texture. Serve with some crusty bread or toasted garlic bread and a green salad for a wonderful meal. Before cooking dried beans, always sort over the beans. There may be sticks, twigs, or stones mixed among them. After sorting, rinse the beans well to remove any dust or dirt and drain them. You can soak the beans overnight to help remove the sugars from the beans that can cause intestinal gas. Discard the soaking water; rinse and drain the beans again, and use them in the recipe. The secret to the best bean soup is to add salt until the flavor blooms. But do this just before you serve the soup. Don't add too much salt at the start of cooking time, since the bacon is salty. Tomatoes are added at the end of the cooking time because the acid in tomatoes prevents beans from softening, even when they're cooked for hours. If you like, you can mash some of the beans for a thicker soup before adding the tomatoes. In a large pan, cook the bacon until it is crisp. Drain it on paper towels, crumble, and set aside. Add onions and garlic to the bacon fat remaining in pan; cook 3 to 4 minutes, then place in 4- to 5-quart crockpot. Add bacon, hearty bean soup mix, carrots, water, salt, pepper, and bay leaf to the slow cooker and mix well to blend. Cover crockpot and cook on low for 9 to 11 hours until the beans are tender. Add the tomatoes, stir well, and cook on high for 30 to 40 minutes longer until hot. In a small bowl, mix the sour cream with cornstarch using a wire whisk and stirring until smooth. Add 1/2 cup of the hot broth from the soup and mix well, then stir into soup. Cover and cook on high 10 to 15 minutes until thickened, then serve immediately. Store any leftover bean soup in the refrigerator. This makes a big batch, and if you don't eat it all within a couple of days, freeze it to serve later. It will reheat well in the microwave. If you have appropriate individual-serving bowls with covers to freeze it in, you can easily take the frozen soup with you to work and it will be defrosted enough to microwave for lunch. Did You Know You Can Make Salmon With Onions and Carrots In Your Crockpot?